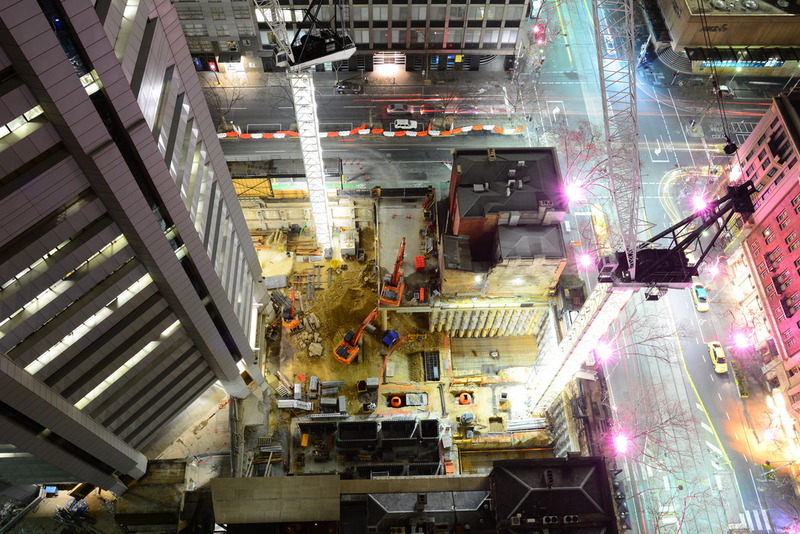 Urban Melbourne recently highlighted three key projects which are shaping the western end of Collins Street. Today the attention turns to Collins Street's east end (I staunchly refuse to refer to it as the Paris End) whereafter what seems like an eternity and about 20 different design schemes, owners GICGRE appear to have finally settled on a design, as builder Multiplex pushes ahead with construction of the 80 Collins Street transformation. 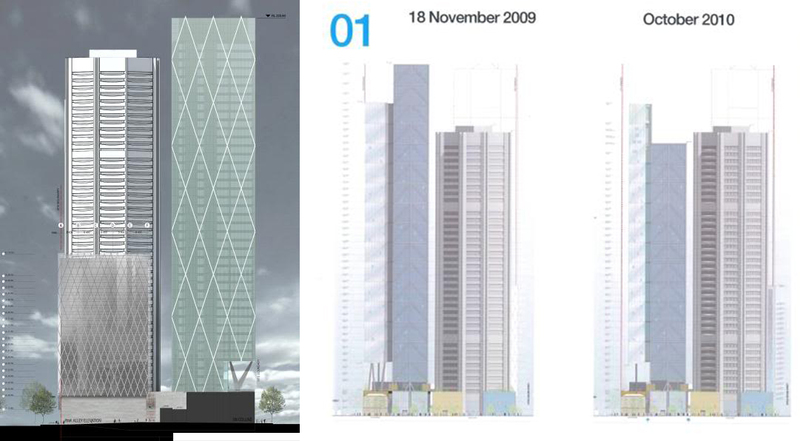 The progression of 80 Collins Street. Images: Various including Woods Bagot, Squint Opera, Floodslicer, OurVision. The earliest designs for the site were first mooted way back in 2008 and featured a green glazed tower wrapped in a diagrid structure, not too dissimilar to the under construction Avant on A'beckett Street. The design evolved to become two rectilinear volumes - one expressed as a cantilevering crystalline form attached to a ladder frame freestanding mass. Over time a number of concepts were developed some including columns to support the cantilever others without any structural supports but the tower language, for the most part, remained the same. In other instances, the heights of the two volumes were interchanged with an enclosed rooftop garden crowning the building. The darker tones of the ladder frame structure and retail portal frames were eventually replaced with a visually brighter frame and streetscape treatment of stone and clear glazing. The latest iteration for the $800 million development is the result of a collaboration between global locals Woods Bagot, London’s Seventh Wave, UNStudio and Paris-based Jouin Manku. The design of the retail streetscape draws on the existing built fabric retained on site with an emphasis on proportions and human scale against the backdrop of a 190m tower. In our pursuit to create a globally relevant footprint, we have partnered with four of the world’s leading design firms to bring our vision to life. 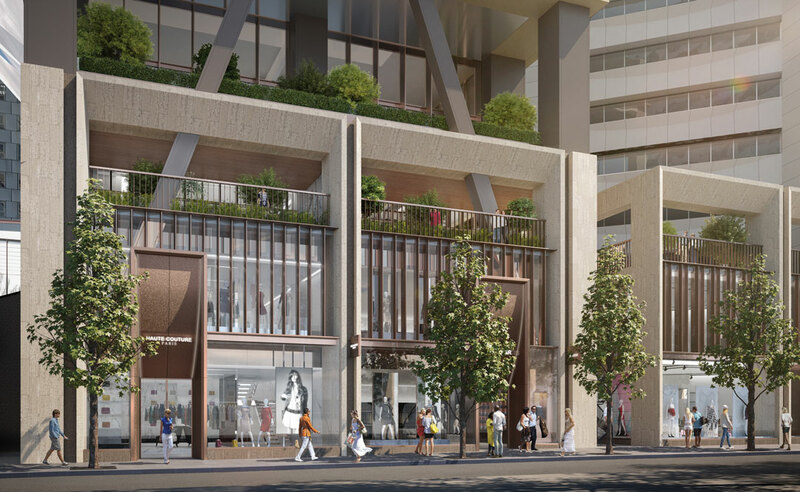 Woods Bagot, Seventh Wave, UN Studio and Jouin Manku, have each been engaged to create an enduring, mixed-use development, which harmonises the precinct with its environment and the people who will inhabit it. Included as part of the plans are Singapore-based hotelier, SilverNeedle's 300-room NEXT hotel, its second Melbourne hotel following the recent completion of its Sage hotel in Ringwood as part of the Eastland Shopping Centre expansion. The hotel is due to open in 2019. SIlverNeedle's commitment to operate the Little Collins Street hotel, in conjunction with QICGRE securing Macquarie Group as an anchor tenant for approximately 6000 sqm of commercial office space in the new $550 million tower, allowed the project to finally commence after 9 years. Macquarie Group will relocate from their current premises at 101 Collins Street. The existing tower once known as Nauru house will also undergo a significant refurbishment as part of the project.